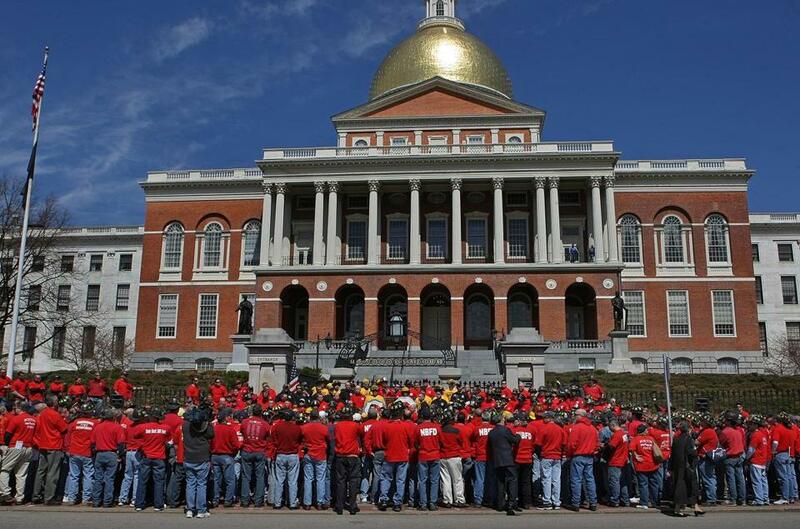 The Massachusetts State House, usually vacant over the weekend, was filled with action Saturday. House and Senate lawmakers also voted to restore $1.2 million in election funding, including money to fund early voting for the presidential election in November. The inaugural program would let people vote between Oct. 24 and Nov. 4, said Secretary of State William Galvin, the state’s top election official. “This is about helping the voters participate,” Galvin said. Legislators also reinstated $23.5 million for cash benefits for low-income families with children, $7.2 million for services for people with developmental disabilities, and $32,297 for specialty drug courts. DeLeo said specialty drug courts are helping the state combat the opioid crisis. Senate lawmakers worked late into Saturday night to restore other spending. They voted to override Baker’s veto of $2.5 million for incentive grants to state universities, $500,000 for preschool planning across the state, and $200,000 to support the Bay State Reading Institute, which provides remedial services to public schools. The Senate also restored $400,000 for Suicide Prevention Services for Samaritans Inc. They also voted to reinstate $300,000 for prostate cancer research and $150,000 for the Down Syndrome Clinic, both at the UMass Medical Center. Lawmakers ended the night by voting to restore $400,000 for pediatric palliative care services run by the state Department of Public Health. In a statement, Baker spokesman Brendan C. Moss said the governor hopes lawmakers take into account “softening revenue estimates” as they consider authorizing new spending increases. Baker provided a balanced budget plan that reduced spending while boosting funding for education, local aid, and efforts to fight the opioid epidemic, Moss said. In other matters, House and Senate lawmakers passed legislation designed to close the pay gap in the state by holding employers accountable for wage violations proven to have arisen from gender discrimination. The new bill protects employers from being held liable for a pay discrimination claim if they’ve undertaken a “self-evaluation” of gender wage disparities in the past three years and can show “reasonable progress” toward closing the gap. The measure is now headed to Baker’s desk. “This bill will protect women from discrimination in the workplace and close the gender pay gap,” Senate President Stanley Rosenberg said in a statement. The weekend sessions were organized because many lawmakers are expected to be out of state in the coming days for the Democratic National Convention, which starts Monday in Philadelphia. Both chambers plan to meet again next weekend. Globe correspondent Alexandra Koktsidis contributed to this report. Laura Crimaldi can be reached at laura.crimaldi@globe.com. Follow her on Twitter @lauracrimaldi.